Countless ways to use apples in cooking, but usually immediately come to mind different desserts and sweet dishes. Sorry, not a frequent visitor on our table pickled and marinated apples, and it's a great snack and a good ingredient for tasty salads. 80 ml juice of berries. Pickled sour applessort apples very carefully, get rid of fruit stains, wormholes, wash, dry and prick each a sharp wooden stick. Boil water and cool to below 85°C, pour the apples this water and keep in water to cool. Sterilize jars and fill them with apples to the point where they start to taper off. Prepare the marinade: pour 450-500 milliliters of water in a pan, heat and add about 400-450 grams of sugar, stir and add spices to taste, it can be 5-6 things dried cloves, 5-6 peas allspice, vanilla pod, cinnamon stick, all goes well with apples. Bring to the boil and reduce the heat to low, simmer until the sugar is completely dissolved and the spices smell. Cool a little marinade, strain it through a folded 4-5 times cheesecloth and add 100 milliliters of vinegar, stir, and heat. Pour the hot marinade the apples in the pot. Use to marinade the water which you poured the apples. 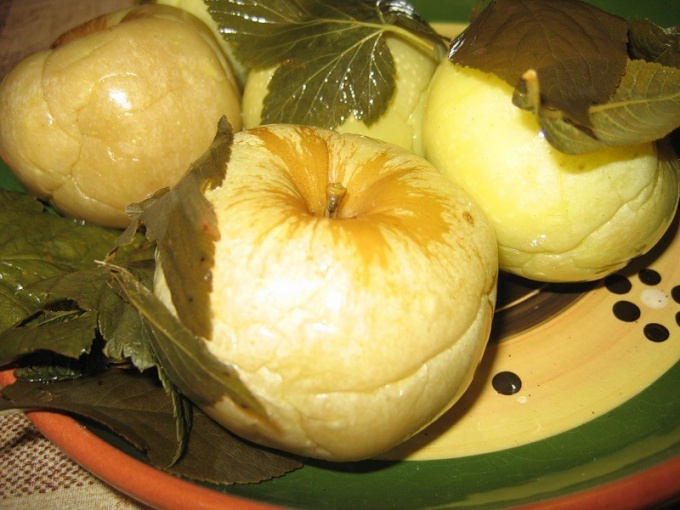 Pickled sweet applesTake apples summer varieties, carefully go through that there is only a whole and unspoiled fruit. Wash them and Pat dry, do each small puncture and put it into banks up to the height where the jar begins to narrow. Prepare the marinade: in a saucepan, pour 500 ml of water, add 250 grams of sugar, and then spices to taste. Bring the mixture to a boil (sugar should be dissolved), slightly cool and strain through a folded several times using gauze or a cloth. Pour in a solution of 80 ml of vinegar and 80 ml juice of sour berries. Heat the mixture and pour the apples in the pot. Cover with lids and place in a saucepan with hot water. Bring the liquid to a boil, boil 3 minutes, remove the pan from banks with fire. Cool slightly, banks, roll up and turn upside down. Ways of processing apples quite a lot. You can make jam, jam, jam, candy, juices, compotes, etc. Apples can be dried for winter or just to cook Apple pie. The most common form of processing apples is jam, cooking recipes which a great many. They can be found in various journals on the culinary pages in special editions for the procurement, at appropriate sites on the Internet. Besides, every good housewife has her own recipe with a secret ingredient. Certainly a great recipe to share with you your grandmother or mother. Jam and jam in the ways of cooking like a jam. The difference is of thicker consistency. Of them in the future, you can make bagels or cookies kurabe. It should be noted that when the above method of processing apples, the valuable qualities of this product are lost and only calories remain. Still, the jam making is popular among Housewives. You can also cook a marshmallow. Usually you have to cook the apples, passed through a sieve and, after mixing with a small amount of sugar, spread on oiled baking sheet. Cooked at relatively low temperatures. Candy Apple are very fond of children. Besides, it saves the portion of the vitamins. Accordingly, it is a more useful product than jam. Is currently the more popular is the home cooking of natural Apple juice, as this processing, the apples retain more healthy properties than when cooking the compote. In addition, the juice can be boiled in solarce no sugar, which is very important for people with diabetes. And for the owner of an Apple orchard, juicing is a must. One of the best methods of processing is the drying of apples. Dried fruits retain almost all of its useful properties. Of them and the same compote can be cooked in the winter, while the store-bought apples this time of year are losing their valuable qualities. And how nice it is to sit in the evenings in front of the TV and eat dried apples, and popcorn or chips. Although, of course, when watching TV or sitting at the computer there is never. Apples can be filled with pies, stuffed Christmas goose. 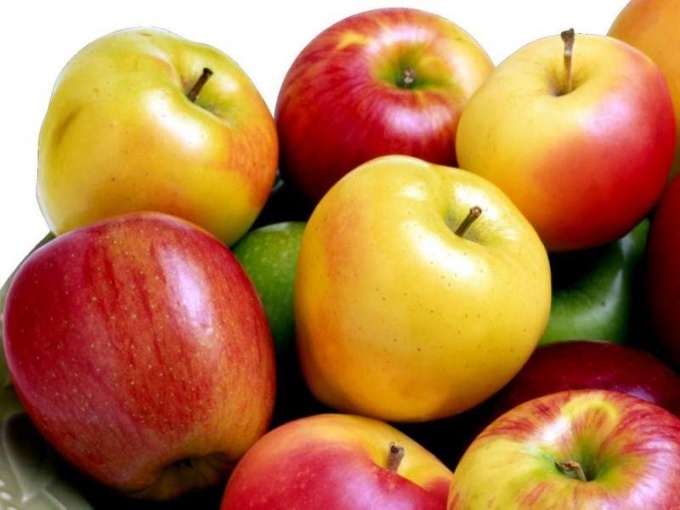 From sweet varieties of this fruit makes a wonderful Apple pie. But for young children it might be nice to bake an Apple stuffed with honey and crushed biscuits in the oven. Healthy and delicious food.